It has long been noted from fossil evidence that the skeletal structures of dinosaurs are more like those of birds than reptiles. One obvious conclusion from this is that dinosaurs became extinct because they were constantly crashing into windows. [+5] - FBM - 04/01/2015Proof: This affected the evolution of Windows and is the reason it crashes so often. Proof: This affected the evolution of Windows and is the reason it crashes so often. Thank You, fellow science scholar! I'm here to try to help. It says that Noah, his family and the animals went inside the ark. Noah installed window shutters for protection against the coming storm. Then after all of them were inside, "God" himself closed the door. 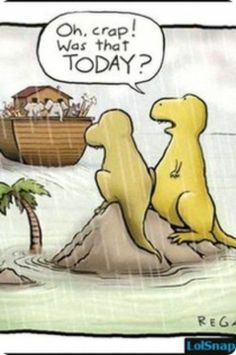 The dinosaurs were late, as Lot's wife getting out of Sodom, and the rain wet their feathered bodies. They crashed against the protected windows and the closed door. It could be they all flew to Venus and for some reason could not come back. Unless they travelled thru Eckankar. Mark Twain's reason for the dinosaur's extinction was that Noah had just completed the Ark, and a runner arrived and told him that the dinosaurs had heard about the Ark, and they were coming. And they weren't coming in twos; they were all coming, and they were all going to all get on or know the reason why! They should'a tried the Paleo diet. Only a few, large land-based animals were affected. The main impact was to cause Easter to oscillate around the first day of the month. we wasnt there so it dint happen. somebody wasnt there, were so sorry. I read it in a book, something something something by Doxa, Episteme, and Gnosis. 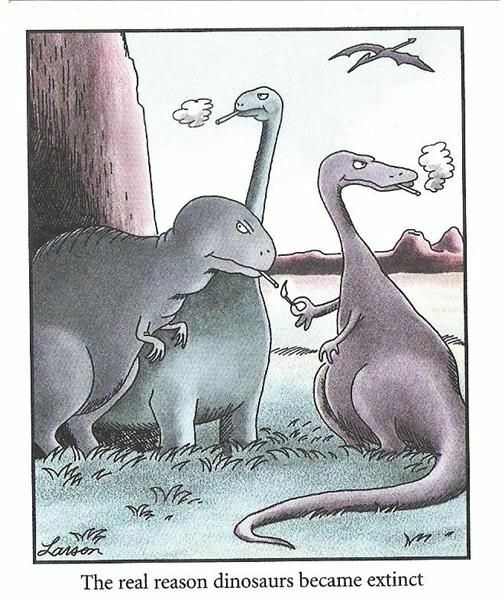 I reckon overspecialization played a part in the extinction of the dinosaurs. What i am talking about is something similar to the Panda Bear. And the reason is, when you have a fairly static environment for a very long time, species tend to specialize more and more. And the more specialized, the more difficult it is to adapt when things do finally change. It wont be the predators so much, it will be the prey animals. Being larger animals with a slower breeding cycle also makes animals slower to adapt to change. If you look at the different species of grazing animals on the plains in Africa today, you will see that each species has a little bit different grazing strategy. if you did not change the environment for a very long time, those differences will lead to greater and greater specialization. However, the ever changing seasons and weather patterns from year to year keeps this specialization in check to some degree.